This would be the Vincentiansâ third match in the NACRA 15-a-side championships, and the first on home soil. The last time both outfits faced each other, last May in Tortola, St Vincent and the Grenadines finished triumphant, 24-22. The current championships see St Vincent and the Grenadines at the top of the South Zone Cup League with a 1-1 record and 4 points, courtesy of a pair of bonus points in their two matches. In the Vincentiansâ first match against group favourites Curacao, they tied 24-24 on March 7 and three weeks later stopped St Lucia 16-8, in St Lucia. 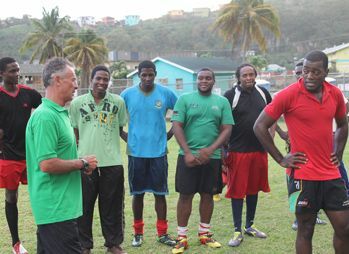 Looking ahead to tomorrowâs match against the BVI, head coach of the St Vincent and the Grenadines outfit Mark Winder said his charges are bracing themselves for a tough encounter. âTraditionally, they have a lot of expats from South Africa and England who are well experienced in rugby, so we know it is going to be tough, but playing at home should give us a boost,â Winder noted. âHaving said that, they (Vincentian players) have learnt a lot; there are structures in place and once we execute, we will do well,â he added. Winder is banking on the natural athleticism of his players to see them over the line.